The conference ( First Circular and Second Circular ) will include plenary invited talks and parallel tracks with contributions through abstract submission. The program will start on Thursday morning, June 9 with plenary sessions followed by several parallel tracks. The program will conclude by noon on Tuesday, June 14, with final plenary sessions (see Schedule at a Glance). Details of the program are now finalized, please visit TIPP 2011 Agenda Server on CERN Indico system. From there, please click on Time-Table for details of the daily program. Speakers can find out exactly which session your talk is assigned this way and should upload your talk using the indico system (see Instructions on how to upload your talk). A pdf version of the agenda is available here. To locate the room for each meeting at the hotel, please take a look at the Sheraton Hotel floor plan . A full TIPP 2011 Program Book (Abstract Book) is available here. The program book has all details of the conference, including the full agenda with speaker name and title, track conveners, session chairs, abstracts, full registrant list, sponsor exhibitor list, as well as general information such as casual dinning, maps etc. We encourage contributions that cover performance results from operating detectors and instrumentation, and of particular interest, how the current technology enhances or limits physics reach, as well as current R&D activities and future plans. We also look for new ideas and forward-looking talks on future opportunities that have the potential to transform the field. One of the goals of the conference is to explore innovative solutions in instrumentation that will further enable our scientific exploration. As such, all phases of detector R&D will be entertained. The abstract submission has been closed. In total, we have received 460 abstracts, about 350 are selected for oral and 80 for poster presentations. Conference proceedings will be published in Physics Procedia, a fully open access journal covering conferences in all physics disciplines. The deadline for paper submission by authors is Sept. 15th, 2011. The page length limits are 10 pages (plenary talks and overview talks at parallel sessions), 8 pages (standard parallel talks) and 6 pages (posters). We will use the online TIPP 2011 Elsevier Editorial System (EES) for managing the paper submission and peer review process. Author Guidelines specifically TIPP 2011 and publication status update can be found here (last updated on Aug. 12, 2011). The program committee would like to dedicate one session (June 9th, 6:15-7:15pm in Chicago Ballroom 8,9&10) with a tribute to Georges Charpak, who revolutionized the field of particle detectors, to his contributions and his legacy to the field of particle physics and society. Invited speakers: Leon Lederman, Stan Majewski, Nick Solomey and Ioannis Giomataris. We will have three courses on various aspects (silicon detectors, electronics and neutrino detectors) of particle detector technologies for young physicists. The lecture time (~3 hours) will be on the afternoon of Friday (silicon and neutrino) and Saturday (electronics), June 9 and 10th. Lecturer for silicon detectors will be Dr. Carl Haber from LBL, for neutrino detectors will be Prof. Mayly Sanchez from Iowa State University, for electronics will be Dr. Gary Drake from ANL. Please check the time-table for details. A satelite meeting organized by the DPF Instrumentation Task Force to discuss the US national program on instrumentation in high energy physics will be held in the afternoon of Wednesday (4-6pm), June 8th, at the Mayfair room. There will be a DPF Instrumentation Taskforce Town Hall meeting on June 9th around lunch time (starting 12:45) in the same room. This meeting will provide the community with an opportunity to appraise themselves of the status of the work of the task force and provide input on the structure of future support for detector development in the US. The co-chairs of this meeting: Ian Shipsey (Purdue) and Marcel Demarteau (ANL). A satelite meeting on 3D vertically integrated electronics will be held on Tuesday, June 14 afternoon.Three-dimensional (3D) integration is a transformational technology pursued by industry for obtaining much higher performance from the current generation of integrated circuits. This meeting will be a forum to review the current status and future plans for R&D on 3D electronics for the fields of particle physics, photon science and medical imaging. The meeting is anticipated to stimulate new developments of radiation sensors and detector electronics, not yet pursued, in partnership with industry. The co-chairs of this meeting: Gregory Deptuch (Fermilab) and Craig Keast (MIT Lincoln Lab). The preliminary agenda of the meeting is here . There will be a poster display space (Chicago Ballroom 6&7) that will be open for the duration of the conference in Chicago Ballroom 6&7. Two special poster sessions will be held in the afternoon of Friday (June 10th) and Monday (June 13th). Each poster to be displayed in the space designated by the paper may occupy the area equivalent to the A0 standard (841 mm width × 1189 mm height). For details, please take a look at Instruction for posters . A Best Poster Selection Committee has been formed, chaired by Ariella Cattai and Junji Haba. The committee will select three best posters by Monday June 13th, and the winners (& prizes) will be announced on Tuesday morning at the end of the plenary session. There will be an exhibitor display space (also in Chicago Ballroom 6&7) that will be open for the duration of the conference in Chicago Ballroom 6&7. A special exhibitor session will also be held on the same afternoons as the poster session (Friday and Monday). Note that the reception on June 9th is also at the same place. There will be a reception at the Sheraton on Thursday, June 9, in Chicago Ballroom 6&7 from 7pm to 9pm. All participants and companions are invited to join. 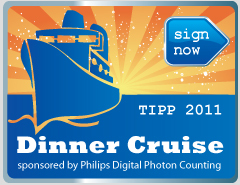 TIPP 2011 & Philips Digital Photon Counting (PDPC) are pleased to announce the dinner cruise workshop on Friday night. The boat is the "Summer of George" from Chicago Cruises, with maximum capacity of 200 passengers, and will cruise the Chicago River and Lake Michigan, weather allowing.It is docked on the Chicago River at 330 North Wabash, between Wabash and State Street. The cruise is for three hours from 8 to 11pm (boarding starts at 7:45pm), with a guide who will highlight architectural landmarks and Chicago history. The catering will come from Harry Caray's and includes a full service buffet dinner with starters, main course and desserts. All TIPP 2011 registrants and companions are invited to participate this event,but the space is limited. Updated on June 15th: A set of selected photos (all compressed) from the dinner cruise, along with the questionnaire from Philips, can be found here . There will be no meetings on Sunday, June 12. Chicago is a city with many attractions that people can explore on their own. There will be a free public lecture on Sunday afternoon (3:30 pm to 5pm),June 12. Speaker: Dr. Lyn Evans. Topic: "Marvel of Technology: the LHC, machine and experiments" . Location will be Chicago Ballroom 8,9&10 at the Sheraton Hotel (with ~500 capacity). The Conference banquet will be held in the spectacular venue of the Mid-America Club of Chicago on the top floor of the AON building. Cost for the dinner is not included in the registration fee. See the Mid America Club website. Please note: there is a dress code. Blue jeans are not allowed!